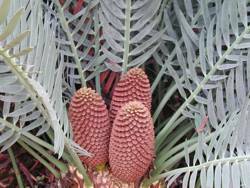 Cycads are a primitive group of seed-bearing plants and are one of the oldest plant groups in the world. They are remnants from prehistoric times when dinosaurs roamed the earth. Male and female cones are borne on separate plants and plants do not form cones every year. A pathway through the Cycad Garden will lead you up and over the ridge towards the Succulent Garden. A spectacular view towards the southern section of the Garden and adjacent properties can be seen from here. A water pond with resident weaver birds, spectacular cycads, big shade trees and green lawns all make this a favourite spot for visitors. For more information about cycads visit SANBI’s plant information website plantzafrica.com.